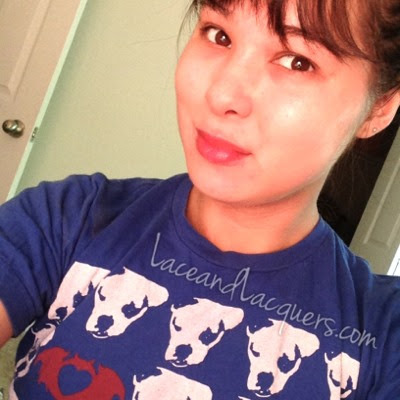 Hello my lovely lacquerheads! Today I have a slew of beauty products by OnyxBrands to show you today. 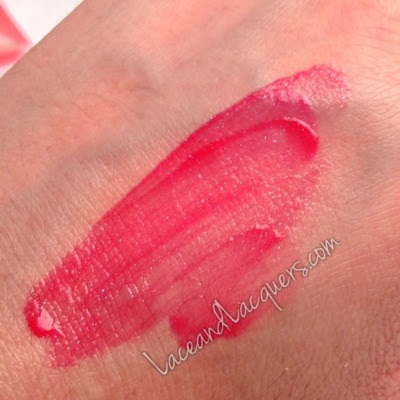 I have a review for everything down to your toes, up to your lips! :P Check out what I have to say about all these items! There might even be a little somethin' somethin' at the end for all ya'll! I was contacted by someone at OnyxBrands to review some of their products for them and to share with you! You might know this brand for their nail polish remover (something I used to purchase many-a-time before I graduated to the big girl size haha) and Hoof brand, more specifically Hard as Hoof! Most of these items you might have seen at your local Walmart, I know I have! And the beauty of it all? They have pretty nice prices! I wouldn't use these files for everyday filing down of my nails. I didn't feel the grit was coarse enough to "get the job done", however I like files like these for quick fixes - like a small snag or something. I can see these being tossed in my purse or one in each of our cars. I did use the nail clippers once, because Lord knows where mine ran off to! They worked just like regular 'ol nail clippers :P But I did like the cutesy design they have. Maybe it'll convince me NOT to lose them haha. 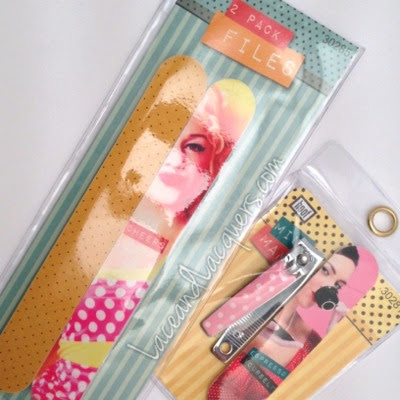 Next are the manicure goodies! Let's start off with the Moisturizing Formula Remover in the Lavender Scent. I was hoping this would be similar to Zoya Remove + or Cutex Advanced Revival. I have seen this at Walmart before in this smaller size and a larger size. I used to regularly purchase my acetone from this brand, until I needed it in larger quantities :P So, I gave this a shot one day! On the bright side, yes it does moisturize pretty well. On the not-so-bright-side, it doesn't have much removing power. To me, personally, it removed a lot like a non acetone remover would remove :[ It did the job, it just took longer than I prefer. If moisturizing over power is something you prefer (something most of us should probably prefer lmao), than this is for you! Next is the Ultimate Hardener. This product is enriched with horsetail grass extract and claims to give you strong nails in 5-7 days. You are supposed to use this in conjunction with Hard as Hoof, which I'm assuming speeds both things along! What I found interesting about this product is you can use it as a base coat AND a top coat, I'm not familiar with another treatment like that... but on the other hand I don't use treatments frequently. I used this product for 5 days as a base coat and top coat. I did not use it with Hard as Hoof, as recommended, since I know how my nails respond to Hard as Hoof by itself. I did notice my nails were a tad stronger, but nothing to write home about haha. As for using it as base/top coat, it doesn't have an intense shine like Seche Vite has and you might find yourself reapplying it more than a usual top coat. I didn't write it down, but I don't remember it chipping, but I did change my mani every 1-2 days haha - life of a polish addict eh? As you can see from the packaging, Hard as Hoof is their #1 seller... and I can understand why. I blogged about this item a lonnnnnng time ago. I found out about it through Andrea/PlasmaSpeedo over on YouTube. I have pretty strong nails, but every now and then they can get kinda "flexy" and can become prone to snapping, especially at the corners. Whenever someone asks me how to strengthen their nails I always recommend this to them, and more often than not they are thanking me up and down for this product. You rub in the cream into your nails and cuticles 2-3 times a day. 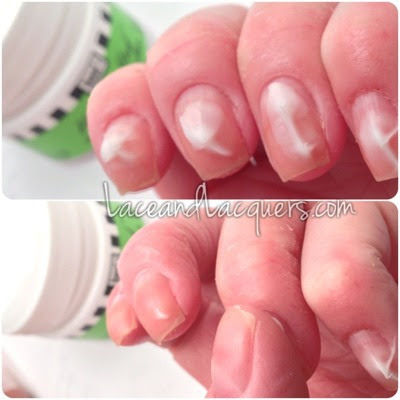 You don't need to slather your nails in it, a little bit (like above) works just fine! When I use this, my nails are usually rock hard within 3-4 days when I abide by the instructions. I always keep it by the couch since I spend most of my time in the living room haha. Another thing I love about HAH, it's only about $5 at Walmart and it will last you FOREVERRRRRRRRRRRRRRRRR. Okie doke! So these are the pedicure related items I was sent to review. Are you still with me?! This is a lot hahaha. The foot file, adorning another coffee related Lacey-appropriate graphic haha, I used once for a pedicure. I don't know why, foot files give me the heebie jeebies! If you are not familiar with a foot file, these are used to smooth the rough parts on your feet. For me, that would be my heels. I recommend using this is before a shower/bath, rub the rough patches (not too hard or soft) and then continue on taking your shower/bath! Instead of sawing the crap out of your feet once, do a little each time before you bathe. Then, after I took my shower... I applied the Hard as Hoof Miracle Foot Cream to the bottoms of my feet, especially my heels. This isn't the same idea as HAH the nail strengthening cream haha, this is a foot cream to help make your feet look and feel softer. Even when I did not use the file, I did apply this after showers or when I got bored and I noticed my heels were softer and less angry looking haha. This comes in a peppermint scent which also is kinda cooling on the feet. In addtion to those pedicure products, I also received a cute foot shaped (oops, I cut it out of the picture, SORRY!) nail clipper. You know what was funny about this I was in my head going "Pft, why does it matter what shape?!" and then I used it and found it was easier to grip and clip my toe nails with. Serves me right haha. Next we travel into uncharted territory! I don't do well with makeup bits, ladies :[ I'm apologizing in advance lmao. Today I get to play beauty blogger - WOOHOO! I hope I made someone proud lmfao, I don't know who, but someone! Anyways, I'm not usually a lip gloss kinda girl... I usually just stick to chapstick because I'm not fond of how sticky lip gloss can be. 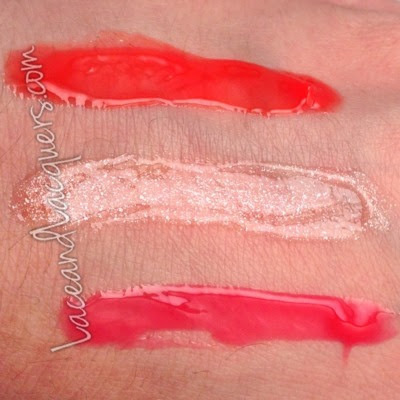 Strangely enough, it's like these lip glosses wanted to prove me wrong. I didn't find these to be sticky. They were soft, glossy, and stayed put rather well. I also liked that there was a range of colors in this set, to nearly nothing (Snowy Kisses) to bold (Rosy Red Lips, Cherry on Top). Not something I would usually pick out for me or someone I know, but now I might consider it. It's a cool little set! 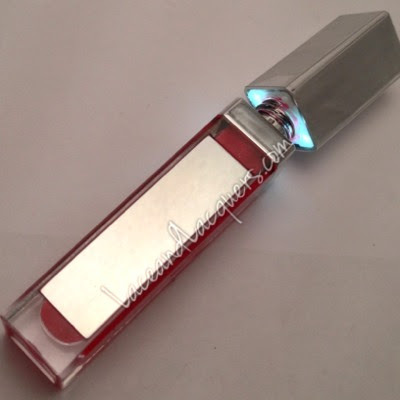 I admit, I was a little skeptical at first of this Luminous Kisses Light-up Lip Gloss. It was just one of those things, in the package, I was just like WHY I DON'T UNDERSTAND WHY IT NEEDS LIGHT ON IT WHY. But Thennnnnn, magical fairy dust and ish happened and I kinda understood its life purpose. 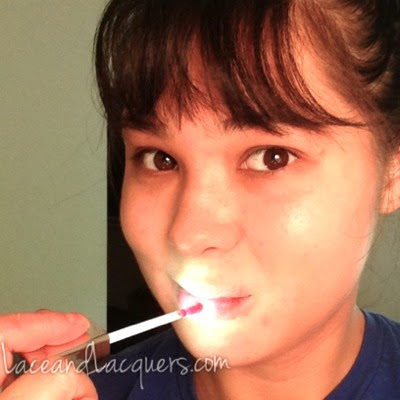 DUHDOY - if you're in the car, at night, or somewhere else dark it'll help you see your lips! *golf claps* Not to mention there's a built in mirror on the side of the tube. Hello, ingenious. I swear I'm smart lmao I just don't use beauty products other than nail polish often. Most of these products, and then some, can be found at Wally World (Walmart). I have seen most of these before in the beauty aisles. If you're looking for more information in these products and more, here are some helpful links! So I said I had a somethin' somethin' for you at the end? Well because you're super awesome and you stuck with me through that entire post and because OnxyBrands is really nice YOU get a chance to win EVERYTHING I reviewed (but new haha) above! - Open to US residents only WORLDWIDE! 18+/parents' permission. - Giveaway is open from 06/04 - 07/01/2013 11:59 PM EST. - Winners will be notified via email and will have 48 hours to respond. If, after 48 hours, no response is received that winner will have forfeited their prize and another winner will be chosen for that prize. - Cheaters will be caught, disqualified, and black listed. a Rafflecopter giveaway These items were sent for review. My opinions of the brand are my own and are not influenced in any way. Please read the disclaimer tab for more information about my reviews. Looking forward to going to two weddings and taking a week-long vacation! This is such a fun giveaway!! 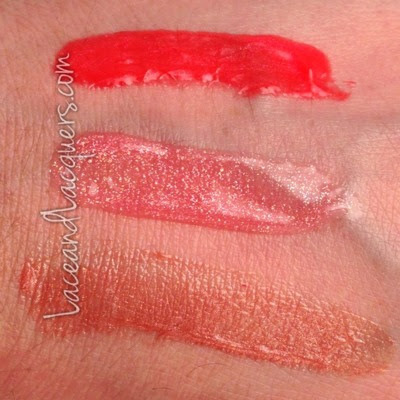 I want those lip glosses!! Concerts! I already saw Creedende, and there's much more to come! I love Hoof, I use their cuticle oil pen (Take the plunge I think its called) and its AMA-ZING. I'm looking forward to go on my vacation to Sozopol. Awesome giveaway! I'm looking forward to spending time with just my son as we live with parents and also take care of grandparents whenever I have to. So time alone with the kiddo on our own mini vacation will be awesome! Really looking forward to camping next month. I'm looking forward to a few concerts this summer. Air conditioning! And losing weight! Swimming, BBQ's and spending time with my kiddos! Thank you for this GA! Im looking forward to watermelons!! I look forward to swimming! im looking forward to hoping going down the shore. Rocking those neon nail polishes! Hanging by the pool with my three daughters! I'm looking forward to the beach,bbq's and bonfires! I'm looking forward to starting my own jewelry shop. I know, I know so many out there. I don't have instagram :\ Bummer! But I just love hanging out with my friends and being adventurous. Looking forward to Disney! Totally going sometime this summer. Fingers crossed! I'm just looking forward to spending time with my two babies in this beautiful weather! Taking my daughter into the pool and hope I find a floaty for her to sit in so I could go under, lol. Catching some keepers anywhere theres water lol Go beach hopping! I'm looking forward to making my 1 year wedding anniversary with my husband! also, really looking forward to seeing a couple other friends getting married. Plus a couple of our best friends are returning from Germany for the aforementioned wedding...can't wait to see them all! I normally use EMJOI's micro-pedi for pedicure at home.